Hindustan Zinc received the “Non-Ferrous Best Performance Award 2018” by the Indian Institute of Metals, under the category of Non-Ferrous Large Integrated Manufacturing Plants. 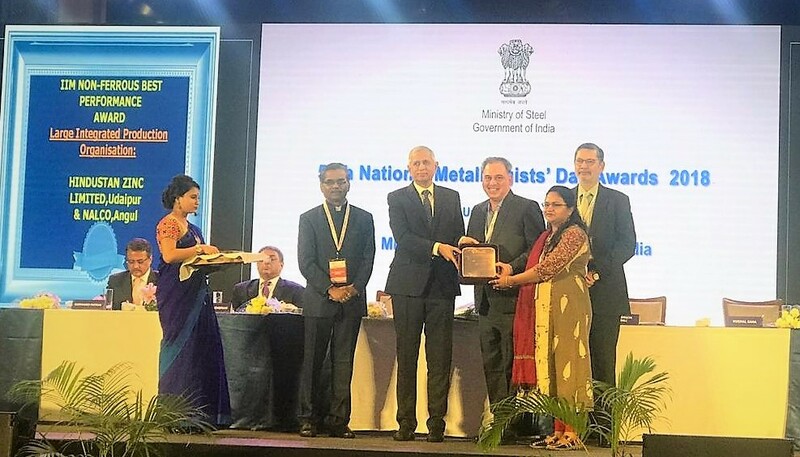 The award was presented by Secretary of Ministry of Steel – Mr. Binay Kumar in the 56th National Metallurgists Day Celebrations & 72nd Indian Institute of Metals Annual Technical Meeting at Kolkata held on 14th-16th November 2018. The award was adjudged by an eminent jury comprising academia from Indian Institute of Metals and presented the award to Hindustan Zinc for the best quality, registering highest product development and environmental performance during 2017-18. Hindustan Zinc presented the R&D initiatives for development of products like Antimony Tri-Oxide, Bismuth Oxy Chloride, Copper Sulphate, Sodium Sulphate and Paver Blocks from the residues & wastes of the Company. On behalf of Hindustan Zinc, Mr. Manoj Nashine & Ms. Sheeba Mashruwala received the award.